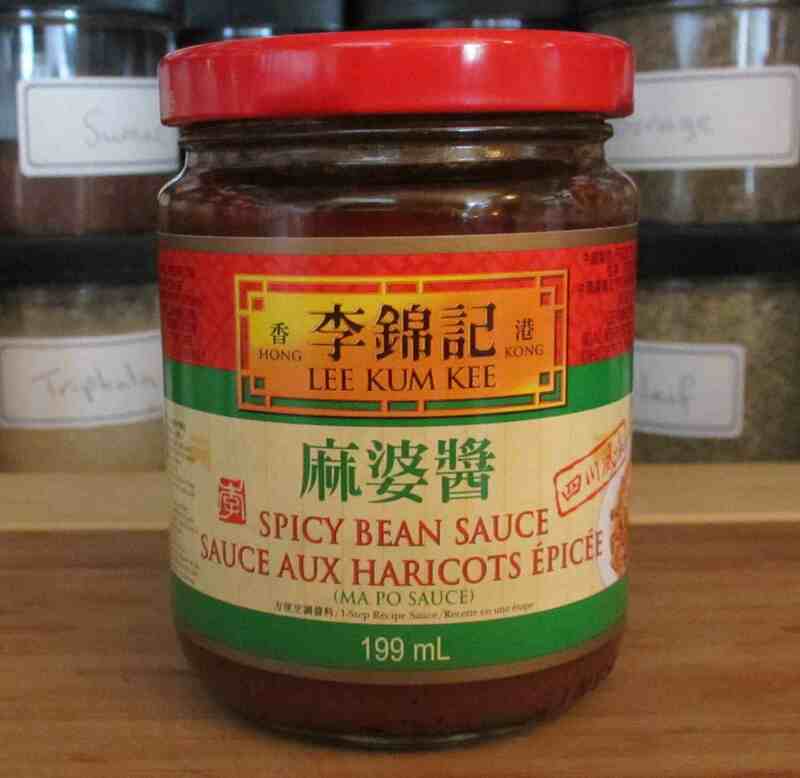 Lee Kum Kee has a pretty hefty product list, including a fair number of sauces based on chili and various beans, so the name of the ‘Spicy Bean Sauce’ you see above is a little generic and vague. 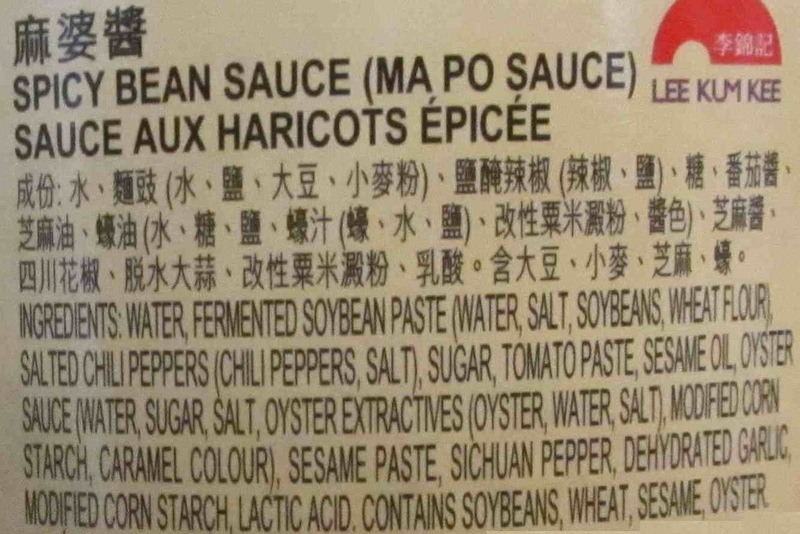 If you look closely at the front of the label, however, you will see the little green letters under the main title (in red) which read: ‘Ma Po Sauce’. This is actually a direct translation of ’麻婆醬’ (the Chinese characters above the English name), which are pronounced ‘mápó jiàng’ in Mandarin. The name of this dish has an interesting, if somewhat apocryphal ‘history’. The basic storyline is that it was invented by an old woman (sometimes identified as a Mrs. Chen) who subsequently became famous for serving at a restaurant she operated with her husband (or, in some versions, her sister). No pictures exist of the woman (which would require she actually existed, of course) but legend has it that she was not particularly attractive, being scarred by pockmarks. The Chinese name of the dish, in fact, is commonly translated as ‘Old Pockmarked Grandmother’s Bean Curd’ although I think it may, possibly, be more properly be rendered as ‘Old Grandmother’s Pockmarked Bean Curd’ as I seem to recall reading somewhere that the ‘pockmarks’ are actually supposed to refer to the Sichuan Peppercorns used in the dish that end up ‘speckling’ the tofu. Whatever the truth of the story, the recipe for ‘Ma Po Tofu’ included on the label is a pretty good example (leaving aside the actual sauce ingredients for the moment) of the basic dish. There are hundreds of recipes extant (both in cookery books and on the Internet) and, as always, there are quite a few variations on the general theme. Basically, Ma Po Tofu, consists of tofu and ground meat (although vegetarian versions exist), all served in a ‘málà’ sauce which, regular readers will recall, combines the numbing (‘má) qualities of Sichuan peppercorns with the (là) spicy heat of chili. Scallions are quite often included and quite a few recipes ‘bulk’ out the basic ingredients with other vegetables such as green beans or peas (especially those still in the pod). The ingredient list, as you see above, contains tomato paste as a major (and quite non-traditional) component and this is reflected in the appearance. 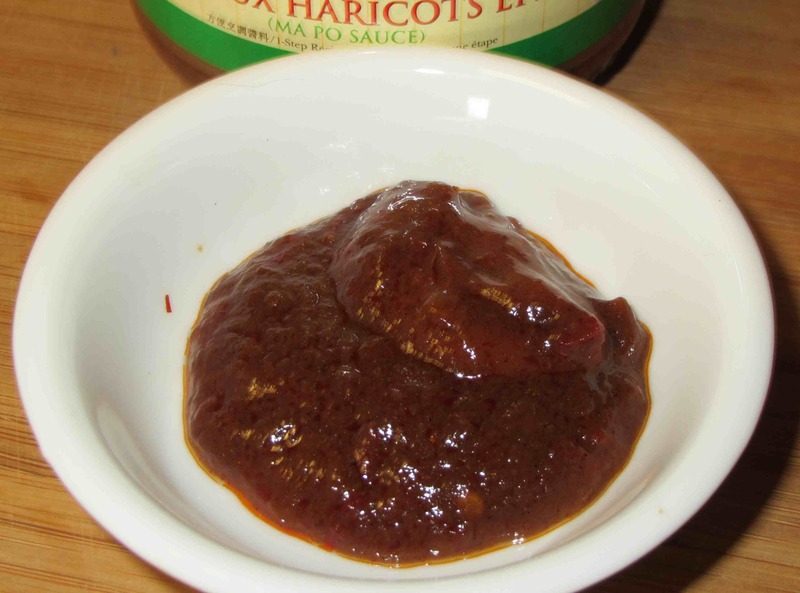 The taste of the sauce, as the ingredient list might suggest, is dominated by a very fruity tomato taste and, although Sichuan Pepper is included as an ingredient, it is clearly added in such small amounts that their taste and ‘numbing’ effect is totally absent. Accordingly, I have to say, after trying this product, that it strikes me less as a proper ‘málà’ sauce than it does one of those generic ‘ready-made’ Chili con Carne sauces. Sadly, then, I have to conclude that it fails in its intended purpose. A Nomination: The Beautiful Blog Award! I am positive we get this brand of product here in South Africa too! Great post. I loved learning more about the history of the sauce and its traditional components. I remember this dish making a stir (no pun intended) during the Beijing Olympics when the Chinese government made a push to scrub menus of “weird” and possibly “untasty” translations of foods and dishes. Old Pockmarked Grandmother’s Tofu definitely made that list! Can’t wait to see what you come up with for the sauce! Thanks!! That’s interesting about the ‘purging’ of recipe names. I gather there was a similar move during the cultural revolution to rename dishes with ‘politically incorrect connotations’. It’s a shame really … it is like pulling down ancient monuments. Anyway … I used the sauce this past week-end with eggplant. My blogging system involves doing up several weeks of posts in advance so it will be at least a couple of weeks before I post that experiment. Richmond, with a predominately Asian population is a short drive from our home. It truly is like visiting another country. I spend a great deal of time in the small Asian grocery stores, and come home with some rather interesting ingredients. I’m looking forward to your experiment. Virginia. Be posted in about 2 weeks …. the experiment was performed (successfully) and the participants survived. LKK definitely makes A LOT of sauces! I find some of them to be redundant and unnecessary, as long as you have the following: soy sauce, hoisin sauce, sesame oil, chili paste, and rice wine vinegar. I always make up my own sauce for ma po tofu — which is good and bad in that it turns out different every time. A couple of LKK sauces are excellent, a few not good at all and the rest just mediocre. Oh yes … LKK is very international. Actually.. if you check out their site, you will see that they have different pages for different regions and languages. Nice write up on Mapo Tofu. It’s wonderful with rice. Lee Kum Kee is very popular in Singapore where I live. Thank you very much … LKK is pretty international. When I was in Iqualuit (about a decade ago), I went to the Chinese restaurant since I was curious to see one up in the Arctic. I had black bean clam with rice. I’m sure there had to be some Lee Kum brand sauce in that dish! Oh yes… the restaurant in the Navigator Inn. Run by Simon (I think it is) and his wife (a sister of one of them helps too). I am going to be featuring the place in a post sometime…. How long were you here? I recall my job interview very well and it deserves a post of it’s own it was so unusual… if you were here a decade or so ago we must have almost crossed paths. Did you ever wish you had stayed? It would be have been a real learning experience if I had stayed. My partner might have had a different opinion..meaning not totally thrilled about the cold Arctic. I went to the general store there and wanted to find books written by the locals (non-whites). I could only see academic works. At the time, maybe it’s just surviving, later the personal voices in English will be heard more and more over the next few decades. BTW, you would hardly recognize Iqaluit now. I think the pic you took of the satellite dishes is on the road to Apex…. It’s all built up now and the ‘Road to Nowhere’… just a dirt road when you were here is a subdivision… in fact my wife and I just bought a house out there. Wow, urban development in Iqualuit. Hope there will be sidewalks. I was assessing it in terms of bicycling length. 30 km. round trip…short trip. I don’t think sidewalks are in our future any time soon. Oh, thanks for the link! I am travelling south to Ottawa next month. I’ll keep an eye out for that brand. Thank you very much. The theme is one of the custom ones from WordPress… there are quite a few free ones available but I chose this because of the menu functions. It is only moderately adjustable, however… I would like to make changes but have reaced the limit of fuctionality with this theme, I think. you are naturally extremely knowledgeable in this region. You’ve got opened my eyes to varying views on this subject with fascinating and solid content material.